I love this quilt! I think the inner piano key border really catches my eye. This one was all hand pieced and hand quilted! Cheddar. Need I say more? You can't tell from the photos but this was a small quilt. I really liked the border fabric and the scalloped binding. These little squares are all appliqued onto the background. Something about it really caught my eye. A nice country style quilt in autumn colors. I was pleasantly surprised to see many hand quilted quilts, but this post is all machine quilting. Amazing quilting! You'll probably need to click on the photo to enlarge and get a good look. Enjoy! 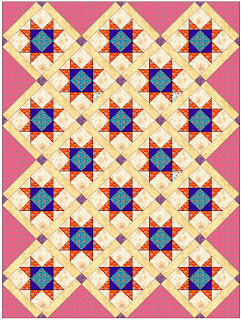 I really like the quilting in the floral setting triangles. 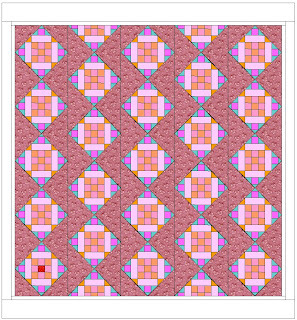 Do you notice the background quilting is micro lines? I'm not sure I've seen that before. 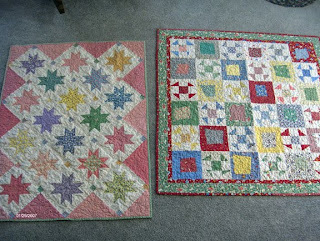 The one above and the one below is the same quilt. I was having a hard time with my camera and the lighting. The quilts were great and I have many photos to share, but I thought I'd start with a few of my favorite booths. Now that fall has arrived my mind was on all things wool. Reets Rags to Stitches. Be sure to click on photo to enlarge. Momma Made It , from Longview WA. I've been there maybe 2-3 times. I love the quilts they had displayed, especially the one with squares to the right of the cashier. Galloping Pony Studio from Moses Lake, WA. I've seen her quilt art online before but they are so much cuter in person! I couldn't wait to come home and start on a few of these tiny blocks so I can make my own. I also thought they'd make great Christmas gifts without making a whole quilt! These are a little less then 2 ". Bird Brain Designs. They had the most adorable items made with wool roving using needle felting. I would have loved to buy a sample, but not start another form of crafting with wool. Do you think fall is here? I didn't actually notice the color of my purchases until after I got home. One other booth I loved but didn't get a photo of was Wooden Spool Designs. I know enough about Electric Quilt to do a few basics. 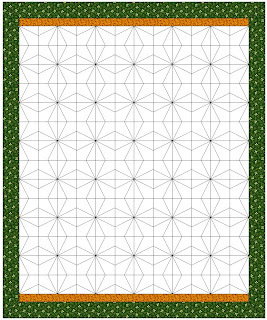 I can play with layouts and figure out how many blocks I want and what size the quilt will be. That's about it. 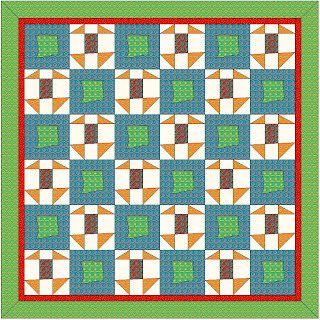 Here's a few layouts in EQ and the quilt that resulted. I have the hardest time with medallions. So tell me, do you use EQ? Are you a whiz? Or still a beginner like me? Any great tips you'd like to reveal? I'm going to the NW Quilting Expo today in Portland then hair appointment with DD then out to dinner to celebrate her 26th birthday! Most of my seasonal decorating is in the form of quilts. This top quilt is one of my fall favorites and greets anybody that comes through the front door. I won the pumpkin man at Jody's blog last week. Sitting by himself he looked a little goofy, but surround him with a little fall flair and he fits right in. My second favorite fall quilt! This one was crooked, but I fixed it after seeing the photo. This quilt reminds me of the blue, blue sky we've been having and the wonderful turning of the leaves. You can see the whole thing here. The flannel quilts are even back out! I've seen many bloggers write that fall is their favorite time of the year. I like this time of the year but I have to say I do not have a favorite season. I grew up north of Seattle and the weather was pretty much gray with rain most of the time. When I moved to Central Oregon I loved that there were four distinct seasons. What I notice the most is when autumn is in the air- you know it. For the past couple of weeks there has been a chill in the evenings. We've had beautiful days, as the photos will contest to. The last cutting of alfalfa. The transition from autumn to winter is a bit blurred. It sure doesn't wait until December 21st to snow. And the crocuses blooming in spring tells me I may be able to plant annuals or a garden in 2 months. I love the change of seasons and welcome them all, on their time. This used to be a quilt shop, up until about 3 weeks ago. It is a cute little house, too bad there wasn't more going on inside. I live in a small farming community of about 5,000. We used to have a great place to have fun and buy fabric. It was downstairs in a clothing store. (something you would only find in a small rural community) The "quilt shop" also shared space with toys and gifts. I taught a few classes there. I purchased my Dear Jane book there. I have fond memories of our department store. They had to close several years ago. So we had no quilting store in our town for quite some time. A few years ago this house opened as a quilt store. I have my thoughts on why it still isn't a quilt store. 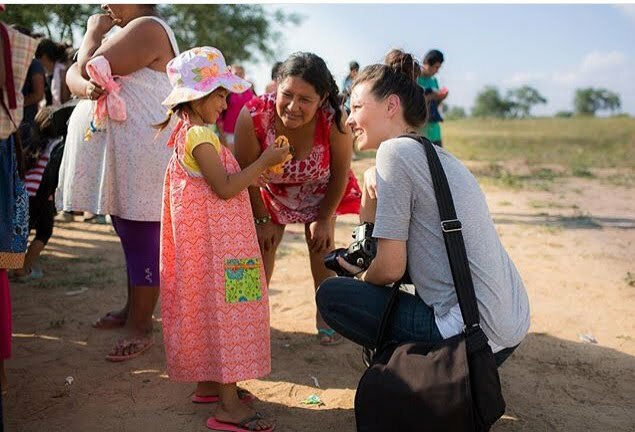 The owner kept her "real" job and hired out help. I have been in that store exactly 3 times. The first time was for ecru or off white quilting thread. They had no quilting thread. The second time I was looking for bias tape maker. I don't think I really even cared what size. Nope, they didn't have that either. The third time I was looking for invisible quilting thread and I did actually score a spool. Now, I consider myself a pretty die hard quilter and I was in her store 3 times in about 3 years!? I think they had as many bolts of fabric the first time as they did the last time. There were no samples hanging, no friendly hellos, just not much of anything going on. I never even heard about any classes! I would like to support the local quilt shops, if I felt they were doing their part. The owner never put herself into 100%. She had to have known in the back of her mind somewhere that it wasn't going to work. What a shame. I actually heard from the quilt shop owner in the next town over that she was closing. If you have a quilt shop please make sure you are giving the customers what they want. We want you to stay in business but we'd also like your employees to be friendly. OK, I guess that's my rant for the day. I feel kinda sad about it too. This is what I have started so far. Well, actually I have the next border pieces cut but because it isn't an easy size to work with I'm having to do a bit of math! 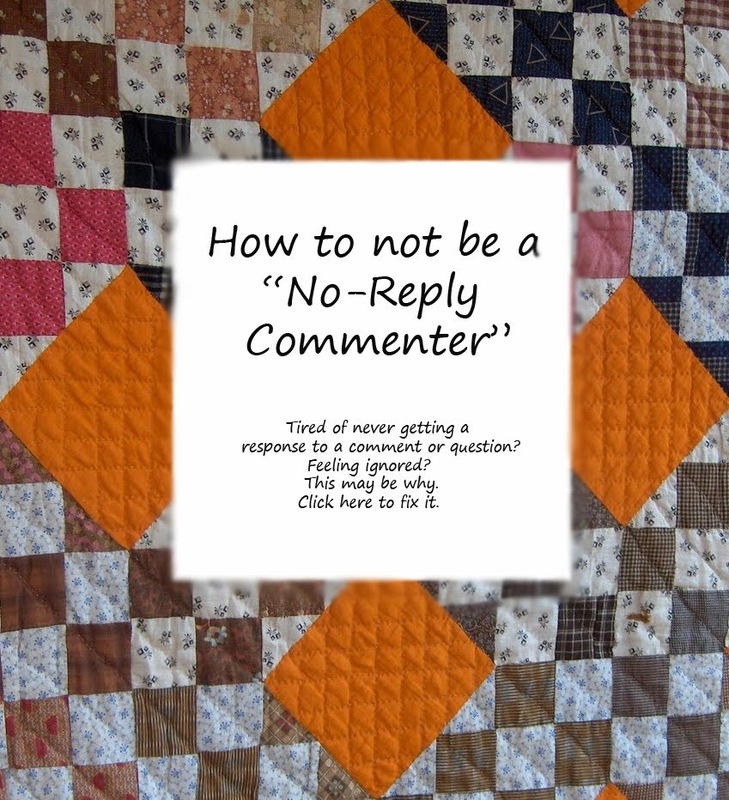 I've shown quite a few borders in other quilts that are just cut off. I'm going to try and not make it look so obvious, but there will be some borders with a little wonkiness. Although I paper pieced the triangles I had to cut them off a bit to make them fit. As I make progress feel free to look for the fudging. I won't be pointing it out. How About a Little Chrome?